Sunny temperatures and a dry track allowed teams and drivers to maximize their performance in the Qualifying Heats unfolding this Saturday on the Belgian International Raceway of Mariembourg. The opening round of the IAME X30 Euro Series is now heading for its last and most important day with Prefinals and Finals to crown the first winners of 2019. An objective on which Freddie Slater (Mini), Josh Rowledge (Junior), Lewis Gilbert (Senior) and Philipp Seewer (Shifter) have taken a prime option by topping the categories’ provisional rankings. 329,Gilbert Lewis(GBR),Persistence(KOSMIC/IAME/MG), Mariembourg, 31 March 2019. IAME Euro Series, © 2019, Alexandros Vernardis / The RaceBox. Lewis Gilbert (Persistence) made the strongest impression this Saturday in the Senior field. 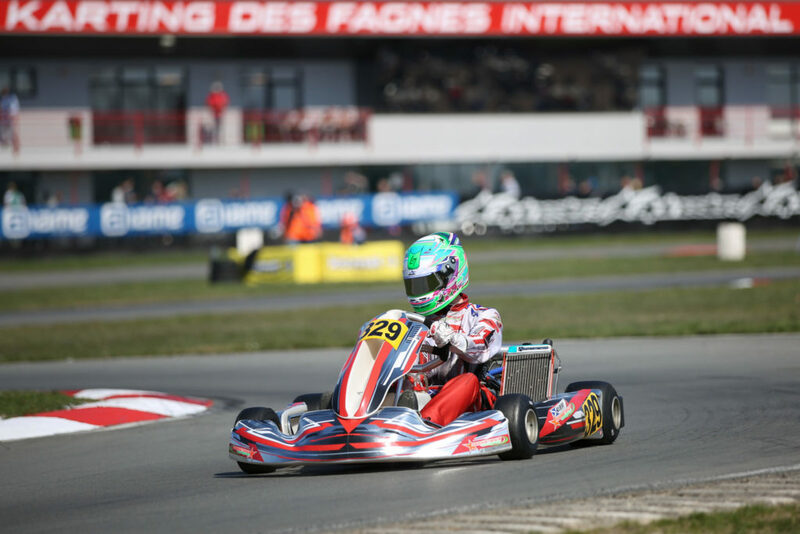 Winner of three Heats, last year’s Euro Series Junior winner rewarded himself with the overall Pole position for the Prefinal. Joey Van Splunteren (Evolution) will try to give him a hard time as the Dutchman will start on the front row thanks to four top-three finishes including one win. Despite an 11th time performance in Qualifying, Jordan Brown-Nutley (Strawberry Racing) managed to recover to third overall ahead of defending Senior class winner Mark Kimber (Strawberry Racing) who claimed two wins. Callum Bradshaw (Fusion Motorsport) produced his effort from 18th in Qualifying to close-up the top 5 of the grid. The Brit will have Elie Goldstein (VDK Racing), winner of one race, by his side, the Belgian aiming to repeat his winning result from 2018 on his home track. 7th on the grid will be Niels Koolen (Evolution) who drove through the field all day to recover from a 33rd qualifying time to eventually enter the upper part of the grid with one win. Also winner of one Heat, Clayton Ravenscroft (KR-Sport) will start by his side on the fourth row of the grid ahead of Danny Keirle (BirelART Middle East), who won his third Heat, and Filip Vava (KR-Sport). Click here for the full Senior provisional classification. On Sunday at 10:30 am, the drivers classified between the 29th and 62th positions will get to compete in the Second Chance Heat for the last six spots available on the Prefinal grid where the maximum amount of 34 drivers will be reached. 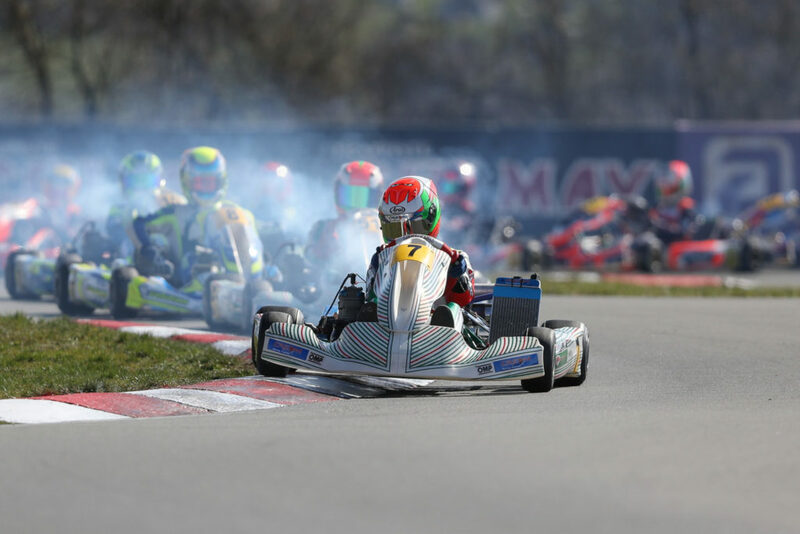 7,Rowledge Josh(GBR),Strawberry Racing 1(TONYKART/IAME/MG), Mariembourg, 31 March 2019. IAME Euro Series, © 2019, Alexandros Vernardis / The RaceBox. Josh Rowledge (Strawberry Racing) left little to no space for doubt in the Junior class. With three Qualifying Heats won, the British driver topped the provisional classification synonymous of Pole position for Sunday morning’s Prefinal. Joseph Taylor (Coles Racing) will join his fellow countryman on the front row of the grid thanks to two wins and a second place. Oliver Bearman (KR-Sport) was the third man to secure a win in today’s qualifying races along with two top-three finishes. He will consequently start from third on the Prefinal grid with Oliver Gray (Dan Holland Racing) by his side to complete a British quartet at the forefront of the Junior field. The Dutchman Kris Haanen (Coles Racing) concluded Saturday in fifth place overall ahead of Liam McNeilly (Evolution), Aaron Walker (Strawbery Racing) while Friday’s fastest man Wigot Edqvist (Strawberry Racing) will try to climb up the order from 8th with Jason Leung (KR-Sport) and Zacharias Ripley (Evolution) closing up the top 10 behind him (click here for the full Junior provisional classification). As for the Seniors, a Second Chance Heat will be run in the Junior class. Starting at 10:10 am, the race will represent one last opportunity for six lucky drivers to enter the Prefinal of the class. 927,Slater Freddie(GBR),Fusion(KART-REPUBLIC/IAME/KOMET), 943,Fusion Motorsport(N/A),N/A(null/null/null), Mariembourg, 31 March 2019. IAME Euro Series, © 2019, Alexandros Vernardis / The RaceBox. Freddie Slater (Fusion) hardly showed any sign of weakness this Saturday around the Mariembourg circuit. From the first spot on the grid, the British driver dominated each of the three Qualifying Heats to claim the overall Pole position for the Prefinal. The Dutchman Rene Lammers (PDB), whose best personal result was a second place in his second Heat, will accompany him on the front row. Leo Robinson (Fusion) was able to recover from 9th on the grid to reach the provisional top 3 of the class ahead of the Spaniard Guillermo Delgado Martinez-Aci (Fusion Motorsport). His teammate Edu Robinson (Fusion Motorsport, 5th) will share the third row of the grid with Pol Chaos Rivero (FA Racing Spain), himself followed by Sacha Van’t Pad Bosch (PDB), Sebastian NG (Team Driver Racing Kart), William Go (Fusion Motorsport) and Lucas Fluxa (Praga Espana Motorsport). Click here for the full Mini provisional classification. Switzerland ruled the gearbox category in Mariembourg as Philipp Seewer (Spirit-Racing) put himself in the lead ahead of his countrymen and teammates Kevin Lüdi (Spirit-Racing) and Michel Biffiger (Spirit-Racing). Seewer secured two wins out of three attempts with the closing qualifying race going to Biffiger who will have Erik Hellemans (DFK) by his side on the second row of the Prefinal grid. Second-fastest in Qualifying, the Greek driver Dionisis Liveris (Daems Racing Team) will only start from 5th partially due to a retirement in the opening Heat. Laurent Malice (Delré Racing Team) concluded his effort with the sixth spot on the grid in front of Thierry Delré (Delré Racing / Mach 1 Motorsport) whose Saturday’ didn’t go as smooth as expected with two DNF’s (click here for the full Shifter provisional classification). 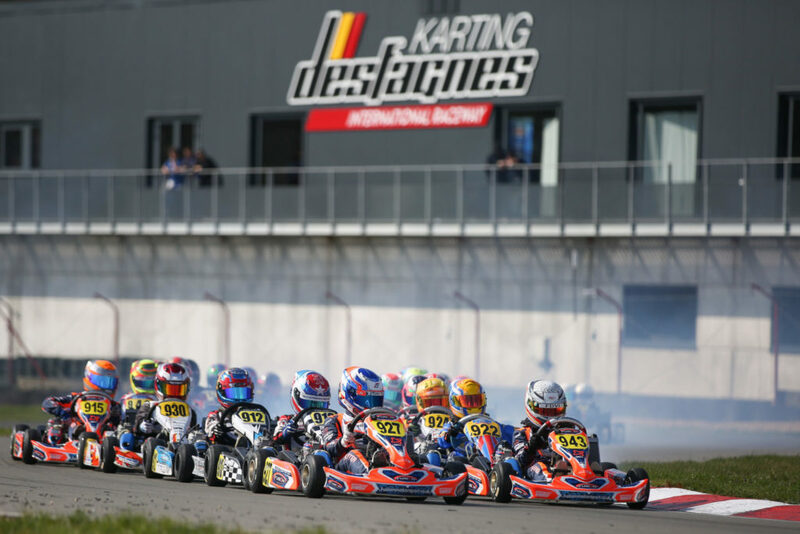 The first round of the 2019 IAME X30 Euro Series enters his final and most important part on Sunday as the first winners of the season will make themselves known on a “Karting des Fagnes” International Raceway once again ready to rumble with exciting racing! To help you follow Sunday’s Prefinals and Finals, a special page is available on this website with Live Timing and Live Streaming along with our complete report available at the end of the day.